When we bought our property in May 1998, we found a simple home-built bungalow on 10 acres that had been rented out for years. This meant that the grounds were so neglected that our friends thought we were brave, or crazy, to take it on. They were probably right on both accounts, but the location was ideal. It was in the country, near Hamilton (we are about an hour’s drive from Toronto), and an easy 15-minutes to my husband’s job. Located across the road from a golf course and a horse ranch, it also had terrific views. We spent our first summer in cleanup and bulldozer mode. Before we could start to lay out garden areas, we had to remove masses of burdock, brambles, poison ivy, buckthorn, falling-down fences, and concrete and stone from the farm’s original barn, long since torn down. Since our second season, we’ve planted hundreds of trees and shrubs and turned a hayfield into a native plant prairie (above). 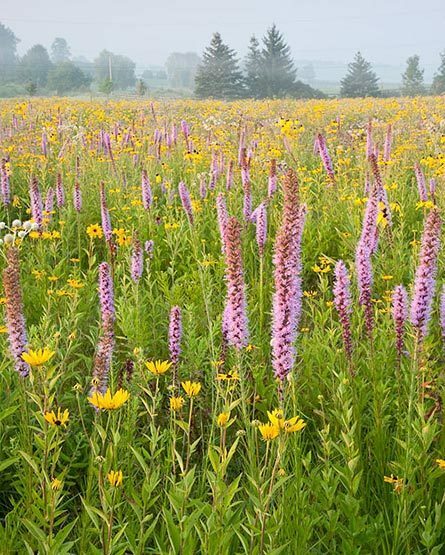 The prairie is my favorite part of the property: it teems with birds and butterflies and looks amazing from mid-summer well into the fall. 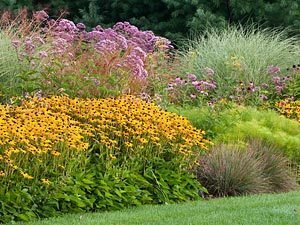 Around our pond, we planted native wetland species, and in the space around the house, we laid out several huge beds of perennials and ornamental grasses. My husband, who wanted to do his own thing, then created a rock garden out of old barn foundation stone that had littered the property. Our farm has been a fantastic garden lab for trying the plants and garden design ideas that I write about. I’m a great admirer of the new wave garden styles of Dutch designer Piet Oudolf, author of Planting the Natural Garden, and of American landscape architects Wolfgang Oehme, and James van Sweden, author of Gardening with Nature. 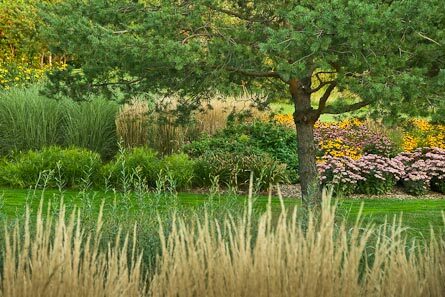 Both Oudolf and Oehme van Sweden use masses of ornamental grasses, which are among my favorite plants. 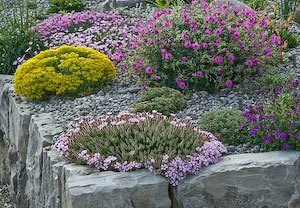 Together with flowering perennials – many of them tough, drought-tolerant North American natives – these plants are perfectly at home in our hot and humid summers and our cold winters. By following the example of these brilliant designers, I have managed to create a garden that is at its most colorful from mid-summer through the fall. This is a time when many gardens – and their gardeners – have given up the ghost for the season. FAQ: Do you still host garden tours? We welcomed many garden tours over the 14 years of owning this wonderful property. It was rewarding and a lot of fun, but as my husband’s retirement was coming on, we sold in 2012 and moved to a smaller property not far away, but in town. We’re still gardening, and you can read about that at my Countygardenerblog. 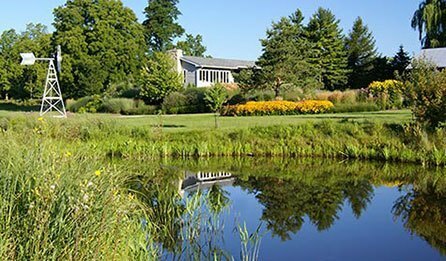 If you are a garden tour organizer: Our part of southern Ontario has excellent garden attractions, see links to gardens worth visiting. Thanks for visiting my site and touring our garden in pictures.